It was a big day for The Queensland Centre for Gynaecological Cancer on 30 October 2016. 15 years of research crammed into a 15-minute presentation to an appreciating crowd of 2,000 attendees at the 16th Biennial Scientific Meeting of the International Gynecological Cancer Society in Lisbon, Portugal. On behalf of 27 surgeons, clinical research staff and our research team, I was able to present ground-breaking research results that spanned from 2003 to 2016 and is continuing. Back in 2003, the standard treatment of endometrial cancer was hysterectomy through an open abdominal incision. Patients stayed in hospital for 5 to 7 days (at least) and took another 6 weeks to recover from surgery. In 2003 my colleagues and I championed a clinical trial that would compare the outcomes of Total Laparoscopic Hysterectomy (TLH; key hole surgery) with Total Abdominal Hysterectomy (TAH; open, abdominal incision). The initial results were mesmerising. Better recovery not only after 6 weeks but even after 6 months from surgery and less pain; less surgical adverse events (complications), which were reduced by one third; and last but not least cost savings of $4,000 per surgical case, which amounts to $50 million per annum for the Australian government. However, and most importantly, it remained unknown until recently if the better operation, that was able to save the government important health care dollars would produce similar survival when compared to the old, traditional operation. Back in 2003, the QCGC Research team and I planned a large clinical trial, which at the time was thought to be undoable; potential funders of the trial believed it was too big an undertaking and too ambitious. We generously received an initial donation from two large surgical device companies which allowed us to employ our first part-time research nurse. With the assistance of this person we started the trial in 2005 and enrolled the first patients. The data were so convincing that more and more funds came in over time and that allowed us to continue the research and expand it. We trained surgeons and assessed them painstakingly. A total of 27 gynaecological cancer surgeons from 21 cancer centres contributed to this research. We needed 760 patients to trust us with their lives and be randomly allocated to either TAH or TLH. Never in Australia’s history a trial so large has been conducted in gynaecological oncology. By July 2010, we assessed more than 1800 patients and enrolled 760. More than half of patients received a TLH. The two treatment groups (TAH and TLH) were strikingly similar in patients’ features (tumour, age, body weight, etc). Only 7% of patients who were supposed to have a TLH ended up having a TAH. This is a comparatively very favourable number internationally and speaks for the excellent surgical quality that our surgeons provided. Corresponding, international numbers range from 10% to 26%. Earlier this year, Prof Val Gebksi from the Clinical Trial Centre in Sydney and his team helped us to assess the data. Unfortunately, 55 patients developed a tumour recurrence. But to all our relief, the disease-free survival (time to disease progression) was extremely similar for both patient groups. The chance of being without tumour recurrence was 81.3% and 81.6%, respectively. 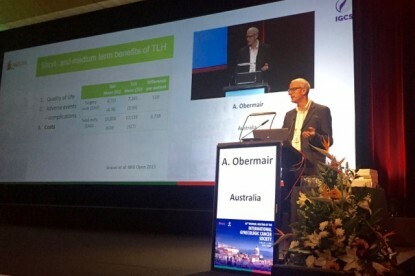 The study has proven that TLH produces similar survival outcomes than TAH! The new operation (TLH) did not disadvantage patients. Previous studies were unable to demonstrate this most important fact. In 2012, a study from the UK pooled the data from 359 patients and claimed that the differences in survival were similar. However, the study was way too small to make such a claim and the findings from this study have to be disqualified as irrelevant and overstated. Another very large trial from the United States enrolled more than 2500 patients and unfortunately, patients who had laparoscopic surgery (TLH, LAVH, robotic surgery) did worse. Our study presented on 30 October 2016 at the IGCS conference was the first properly designed research trial that has shown that patients diagnosed with endometrial cancer should have a laparoscopic hysterectomy (TLH). Given the very severe disadvantages of open hysterectomy (longer recovery, more pain, higher complication rates, more expensive), TAH is outdated and should not be offered to patients who wish to have a hysterectomy any longer. At the Queensland Centre for Gynaecological Cancer we have taken steps now to train gynaecologists in TLH. This program will start in 2017 and I look forward to keeping you updated. I would like to thank not only the patients, our surgeons and our researchers who make this research happen; I would also like to thank those who contributed to the funding of this trial, which cost $2.5 million to date. Funding came from two surgical device companies (Covidien/Medtronic and Johnson and Johnson), bequests, research grants and the Cherish Women’s Cancer Foundation. Without this generous support this research would not have happened.